First, I sent an email to ümobile Customer Service (customerservice [at] umobile.com.ph) and asked for an invite code. (July 2, Wednesday, 4:30pm). Then next morning, ümobile Customer Service sent me an invite code. Now all you have to do is plug in your invite code at www.umobile.com.ph and complete the forms. If accepted, we’ll send an email to notify you. Thanks for applying and answering the first round of lifestyle questionnaires on the site. However, there’s another group of lifestyle questionnaires that you left unanswered. Maybe you’d like to go back and complete them so that we can get to know you even better. Thanks for applying and finishing the questionnaires! Your application is being processed. Just sit tight for our email saying that you’ve been approved as a ümobile subscriber. Then log on to www.umobile.com.ph and enter an exciting world of ümobile. After 4 days, my application was approved. It’s official! 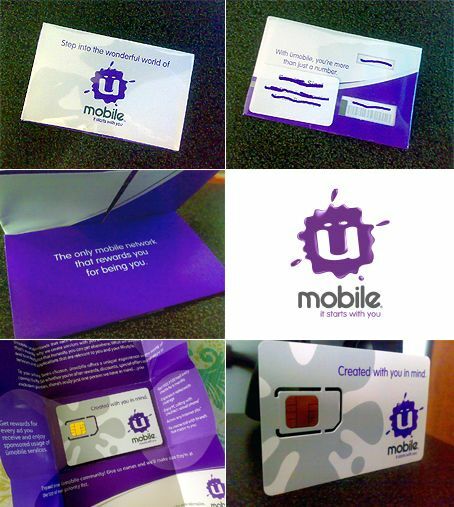 You are now part of the wonderful world of ümobile. As part of the ümobile community, you can call, text, MMS, surf the net, and chat online for free! Well, almost. Wait for the call from our courier to confirm your SIM delivery details. Upon delivery of your new ümobile SIM, please present 1 valid ID and submit a photocopy of this to the delivery personnel. So I called and requested my SIM to be delivered the next day, July 11 at 10am. When she asked for my complete address, I told her that I will send it via text so she won’t have to write it down. The next day, July 11, Friday, the SIM didn’t arrive at the time I expected, which is 10am. The delivery guy arrived at 2pm. So late! I can’t complain, because it’s just a free sim. Anyway, here it is, my Umobile SIM! hi. i’ve heard that uMobile is a subsidiary of smart. is it true? if so, what difference does it make with smart sim itself? and how do you load your account with uMobile? Sorry, I cannot send invites anymore. hey, can i have an invitation too?? tagal nman ng approval nung sa pinsan ko? can you text me about the invite code of umobile? here is my number [mobile number removed by admin] or just mail me at [email removed by admin]tnx…. Sorry, I cannot send invites anymore. Umobile closed their “Invite friends” page. I want to have an access code please!THANKS! @Louise, I sent you an invite, kindly check your email. @Jayson, I sent you an email, please check. @stahn and teddy, before I can generate invite codes, you need to give me your mobile number as required by Umobile. i sent you an email. please check.